FICCI Corporate Social Responsibility Award’ was instituted in 1999. This award aims at identifying and recognising the efforts of companies in integrating and internalising Corporate Social Responsibility (CSR) into their core business operations. 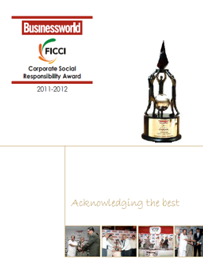 The handbook captures the background of the 12th FICCI CSR award. It details the assessment process, assessment partners, and media partners; introduces the esteemed Jury members that have played a key role in shortlisting the companies for the prestigious award. The profiles of the shortlisted companies has been put forth to share the overview of the company along with the speech marks of Directors, CEO who have leaded the commendable CSR initiatives of their company. The handbook was launched at the 12th FICCI CSR Awards on December 7, 2012.